Alright, since there is soo much drama and tension on here lately, lets talk about something we like for a change. What is your favorite Fixed Bladed head and why. If you are here to thread crap or stir up more poo then please don't post. Lets all just get along. I'll start. Lol. So far my favorite fixed head is Vpa 3 Blade unvented. Very easy to sharpen, very sturdy, completely reliable, and great flight. I haven't been in the game long enough to harvest anything with one yet but come September Imma try. Lol. 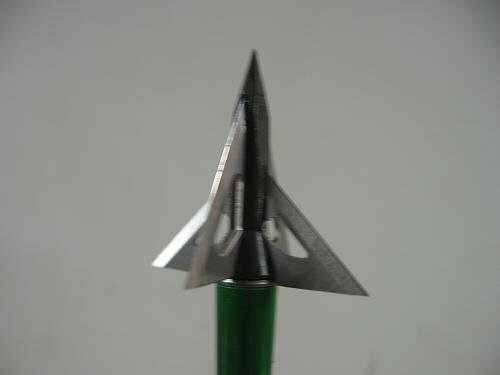 I'm thinking about trying some 2 blade penetrators (vpa) or some Simmons Tree Sharks. Those look absolutely wicked. I just wish they were a little lighter than 190. G5 Maglock Quiver, TRU Fire 3d hunter Release. I really like my Slick Tricks and have always used the Magnums. After Enkriss brought up the idea of switching the GT2 blades onto a Vipertrick I think that is the route that I am going to try this year and see how it works. The Vipertricks are a nice looking head and adding a little bit more blade to them should help a lot. It depends on what mood I'm in. ST and GK are my favs for now but I'm shooting Solids this year. Old tried and true muzzy 4 blade by far nothing else even registers on the meter when it comes to favorite. Why? Bc they are bad THRU the bone. This message typed by a "Trigger punching- shoulder bustin-bow hunter!" I'm a trick fan fo sho, but so far this year i'm going to use the G5 striker 125's & the two GK125XL's I have. I always have used the Slick Trick - "Grizz Trick" model and have had great success with them. That and a good shot placement has made for some short tracking jobs. I have always wanted to try VPA and really don't know why I haven't. GK 100s and ST mags fly great for me, Going to change my arrow setup for my GK 125XLs for this year. I'm glad I did. Can't wait to clean one up after a pass through. Lol. I filled an old turkey decoy with expandable foam and used it as a target earlier this year. My practice tips would be sticking out the back end a few inches but the Vpa's wouldn't even slowdown. Found one about 40 yards past it. I couldn't get the vpa heads I had very sharp and they flew like crap when muzzys flew great. Thankya. Those are the gt2 blades right?